The genesis of the Primary Reel began in 1984 when North Florida cave divers needed a reel with 400-feet of line in order to reach the main line in the Devil's cave system at Ginnie Springs. Voila! The Dive Rite Primary Reel was born. Today, divers may choose between our Primary Cave Reel (RE4300) that has 400-feet of braided #24 line and a medium stainless steel bolt snap or our Primary Wreck Reel (RE4310) that has 250-feet of heavier #36 braid line and an extra large stainless bolt snap. These reels position the handle on top, which helps divers who use a handheld light to hold both the light and the reel in one hand, freeing the other hand to work the reel. 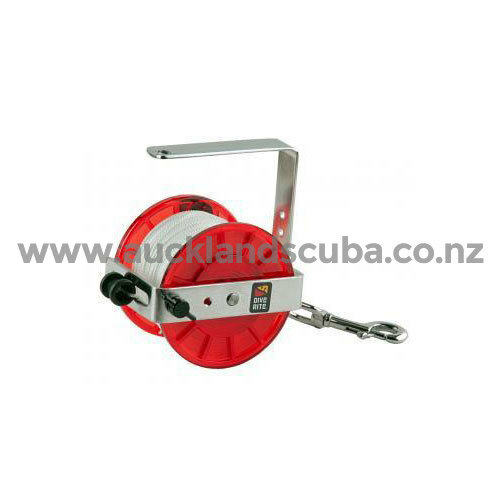 The frame of the Primary Reel comes with a series of pre-drilled holes so divers can change the handle position from a top-mount handle, to a side-mount handle or a left-hand operated reel. The spool is held in place with a stainless steel "C" clip so replacing the spool or cleaning up a jammed reel is simple.